Hiking doesn't really require any great skill. Basically, if you can walk, you can hike. There are some basic ways to make your trip safer, more enjoyable, and leaving you more refreshed than worn out. Just as a long-distance runner doesn't sprint until he's tired and then plod along, you need to pace yourself for the long day ahead. If you have a seven mile hike and 4 hours to complete it, then planning a bit more than 2 miles/hour will see you through. Using your map will help determine if you are on pace, too slow, or too fast. More enjoyable hikes because you are less likely to force yourself to stressful exertion. Consistent demand on muscles, rather than fluctuating strain when you change your hiking gears. Your body should be less tired on comparable hikes. Minimizes need for unscheduled breaks. You plan to hike for 30 minutes, take a break, and hike some more instead of hiking until you need a break. Use of hiking sticks is easier because they become part of your rhythm. Easier to hike with a group when a maintainable rhythm is used by all. Less chance of injury. Hiking faster increases the risk of stepping wrong and getting hurt. A slower pace with fewer rests is better than faster pace with more required rest stops. More even heat generation means you won't need to remove layers while hiking and then add them when stopping to rest. Getting chilled on a hike is a bad thing to have happen all around. Do everything you can to maintain an even body temperature. Start out at a pace that seems fairly easy. Walk for 5 minutes at this pace, taking the same length pace and the same speed of step. After 5 minutes, stop and check your breathing. If you are breathing normally, then increase your pace a bit and start over. If you are breathing heavily or are sweating, then slow down your pace and start over. Repeat this until you settle on a pace that barely raises your breathing but does not make you sweat. Using this pace, walk for 30 minutes and mark how far you've gone. Multiply that distance by 2 to find your miles/hour pace. You might want to measure the distance in your car later. The next day, hike that same distance trying to keep the same pace you used previously. See if it takes you the same amount of time. When you can cover the same distance in the same time fairly consistently, you've found a steady pace. Once you have a steady pace, you can synchronize all the moving parts to set up your hiking rhythm. The goal is to get your body moving in harmony so it is more efficient and can cover more ground before tiring out. Don't start out too fast in the excitement of the new day. Take it easy, warm up, and get into your rhythm as soon as you can. Military groups use cadence to keep in step. You can do the same thing to keep your rhythm. I say a rhyme or sing a simple song in my head to the beat of my steps. It helps keep the same cadence going, especially on more difficult uphill sections. Count your steps. If you are more analytical, counting steps helps keep you consistent and gives you something to think about. Calculate how many steps per mile or steps per hour. Practice breathing. I breathe in time with my steps when I'm exerting more. Getting my breaths synchronized with my steps starts my whole body moving in a rhythm and working as a unit. Take smaller steps when slowing down to go uphill. You keep the same rhythm, but the distance covered is less. This is better than forcing normal strides that require excessive effort climbing. Take longer steps going downhill. Cushioning your joints is important so don't clomp, clomp, clomp down a hill just to keep your rhythm. Breaking your rhythm going downhill will have the least impact on your overall pace so go ahead and be safe on steeper, more dangerous sections. Maintain your rhythm over small rises or obstacles as much as possible. You may need to push a little harder and then coast a bit for short distances. Alter your rhythm just when you really need to. Swinging your arms will keep your upper and lower body synced up and in step with good momentum. I'm 6 feet 2 inches. My stick is 5 feet 6 inches long. I hold it 4 feet up from the tip which puts my elbow at just about a 90 degree bend. My stride is just about 3 feet, so my left foot touches down about every 6 feet. I plant the stick at the same time I plant my left foot, but about 2 feet further ahead. I step with my right foot, then left. When I start my second right step, the stick is far behind me and my arm starts swinging it forward. My left foot and hiking stick swing forward at the same time and plant to start the cycle over again. The consistent swinging and stepping really help me fly over the distance and the thunk of the hiking stick planting is a helpful cadence note. Hiking poles are shorter and lighter but can be used similarly to help keep your rhythm. You'll need to take breaks to give your heart, lungs, and muscles an opportunity to rest up a bit. Breaks will also let you identify any sore spots, hot spots, or potential problems that you may not have noticed while in motion. 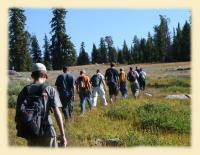 When you do take a break on a hike, try to minimize your impact to other hikers and the environment. Rest Stop - 2 minutes to check your pack, take a drink of water, enjoy the view, and then move on. Leave your pack on for this stop and keep it very short. These work well if you find a large rock on which you can set the bottom of your pack and lean against to take the load off your shoulders for a couple minutes. Use this time to check if the pace is good for everyone. Plan to have a rest stop every 20 minutes to start and reduce to 30 minutes if desired. Gas Station - 7 to 10 minutes to have a snack, use the toilet, and rest muscles. Find a nice durable area off the trail. Remove your packs, sit down, and relax. Stretch out muscles a bit, drink some water, and let your body recover. Take a gas station break every 60 to 75 minutes. Restaurant - 30 to 60 minutes for lunch or dinner. Find a good spot with an enjoyable view and protection from sun and wind if possible. Good time to remove your boots and let your feet relax. Wear a pair of sandals if you brought them. When the break is over, put on a fresh pair of socks for the rest of your hike. Scheduling this stop 2/3 of the way through the hike usually works well. 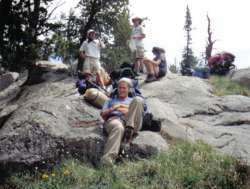 When backpacking, I typically take a 10-min rest (timed on my digi watch) after every hour walking. Got this idea from Colin Fletcher's "Complete Hiker" book and find it to be an excellent strategy for making easily measurable steady progress (my ballpark average hiking rate is 2 mph, incl. rest) without getting too tired or wasting too much time resting. 10 minutes seems to be just enough to cool down, let the heart rate return to resting, and rest the back muscles without getting cold or letting my feet get too swollen. Thank you for the great tips. I am getting back into 5 to 15 mile day hikes, after a few years of skin cancer induced fear of being out in the sun too much. I bought a new Garmin eTrex to replace my worn out GPS, refitted my Camelback with new tubing, have an extra large floppy hiking hat, and have some new convertible hiking pants coming by mail. My wife & I, The Hiking Viking & Mojave Shieldmaiden, are going on a 5 mile hike now, in the beautiful foothills overlooking the Antelope and Victor valleys of southern California, along the edge of the Angeles National Forest. It rained heavily last night, and today dawned clear and warm, and seems to be insisting on us getting out & about & appreciating where we live and move and have our being.